As parents we all want to do the best we can for our children, but sometimes all the advice out there seems to come from a place we can’t relate to! This is especially true for Investigator (NT) parents, who make up the smallest percentage of the population. 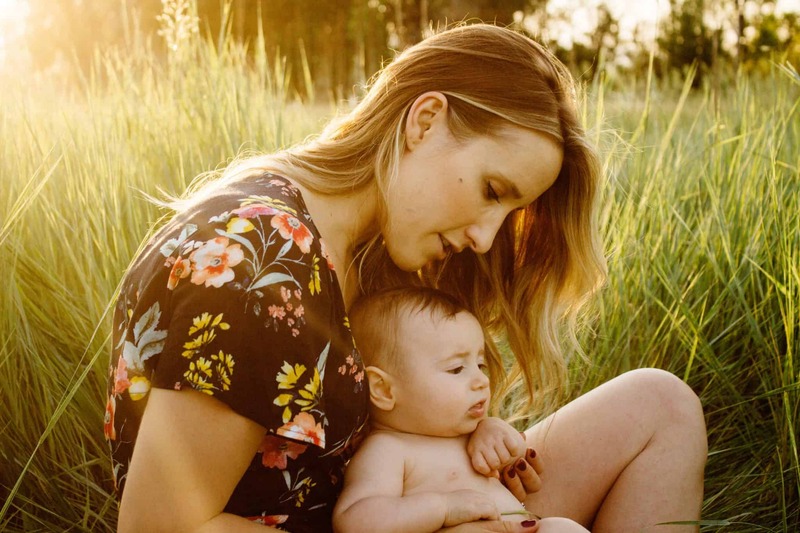 Ranking at only 5-10% of the population, NT parents, especially mothers, may feel like they can’t quite connect with the mommy blogs and parenting magazines of today. Most of the blogs and parenting advice columns are written by SFJ or NF types, and this can leave the NT feeling a little disconnected. The personality types of parents will have an impact on how they decide to parent. All personality types have equal abilities to make excellent, nurturing parents, but they will each have their own unique set of challenges as well. 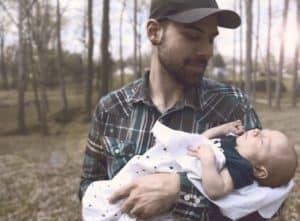 Today I want to talk about NT parents and the kinds of unique struggles and strengths they face as parents. This post is part two in a series that talks about the struggles of all the personality types. If you want to read about the struggles of Intuitive-Feeling (NF) parents, Click Here. If you want to read about the struggles of Sensing-Perceiving (SP) parents, Click Here. I will be posting about Sensing-Judging (SJ) parents next week. ENTJ parents give their children a unique combination of organization and freedom in their lives. They want their children to be independent and free to follow their ambitions, but they also keep things organized and planned out so that children have safe boundaries and stay on track towards reaching their goals. ENTJ parents are excellent troubleshooters and problem-solvers, and can be counted on by their children to provide direction, care, and respect. The ENTJ parent is intense and insightful, and loves to make time to listen to their children’s unique thoughts, plans, and hopes. An ENTJ parent teaches their children that through hard work and focus they can achieve anything they set their mind to. ENTJs are extremely focused and goal-oriented and may struggle with the pace of parenting from time to time. They may feel impatient when they have to slow down and wait for children to get ready to go somewhere, tie their shoes, or when they stop in the middle of a project to complain or express frustration. They may feel like they are having to constantly tell their children to “hurry up”. Perfectionism is another struggle for the ENTJ parent. They hold themselves to incredibly high standards and may overanalyze every decision they make and every reaction they’ve had to their children. They may feel overwhelmed with the responsibility of parenting and may especially struggle with the emotional side of it. ENTJs have inferior Introverted Feeling, which makes it harder for them to be as in tune with their children’s emotions as they would like. They can find themselves wanting to quickly solve problems so that their children don’t experience unpleasant feelings. Being in highly charged emotional situations, even with children, can make the ENTJ unsettled and tense. Plan unstructured time into your daily schedule. Many ENTJs report that if they have penciled unstructured quality time into their daily agenda they don’t feel as impatient or restless about it. Also make some time for yourself! As an ENTJ you keep your life busy and full of projects and tasks, and you may need some unstructured time for yourself to rest and recharge. The INTJ makes an extremely committed and thoughtful parent. They are focused on giving their children the confidence and independence they need to have successful and fulfilling lives. They are independent mothers and fathers, who care less about fitting into a mold and more about finding their own unique style of parenting. They are non-conformists who masterfully walk a fine line between thoughtfully caring for their children and encouraging them to be self-sufficient. INTJs aren’t pushovers, and this certainly applies to the realm of parenting as well. They work hard and will support and challenge their children to overcome any obstacle. They don’t care what all the “other” parents are doing, and will provide an intellectual depth to the parent-child relationship that will nurture independent thinking and insight. Even though the INTJ is primarily logic-oriented, they are extremely thoughtful towards their children and will listen carefully to their children’s concerns and questions. They love to help their children understand the complexities of life and are natural teachers. Perfectionism is one of the main struggles for INTJ parents. They believe in giving one-hundred percent to every endeavor, and this certainly includes parenting. They may struggle with balancing work life and home life because they want to give each their full attention. It’s frustrating for them to put a project aside when family life inevitably interrupts, and to put family life aside when work interrupts. INTJ parents use Introverted Intuition (Ni) as their dominant function. Ni-dominant types need a lot of time and space to be able to form insights and think clearly. If they are in a constant atmosphere of noise, chattering, and the lively atmosphere children inevitably create, they can burn out quickly. They need to remember to take time for themselves to get away and recharge. The INTJ parent may struggle with feeling isolated and misunderstood. INTJs, especially INTJ mothers, make up a very small percentage of the population. 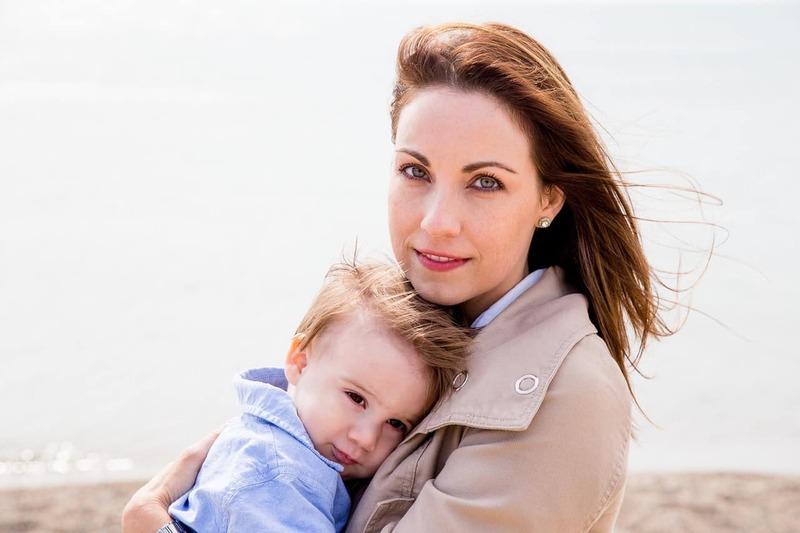 INTJ females make up a mere 0.8% of the population, and as such they may struggle with feeling disconnected from other mothers. The majority of other mothers are SF types, and the INTJ may feel unable to completely relate or “fit in” with these other mothers. Mommy groups and social gatherings may leave them feeling underwhelmed and possibly even bored. It’s important for them to remind themselves of the unique gifts they bring to their family. They are excellent guides, teachers, and listeners who will do whatever it takes to help their children become independent and thoughtful adults. INTJ parents need more alone time than many other parents because of their strong preference for Introverted Intuition. Noise and constant interruptions are especially hard on Ni-dominant types. It is important that INTJs have some time every day to focus on their own independent projects and plans and some time to relax, take a walk, read a book, or find some other peaceful way to spend their time. ENTP parents bring energy and enthusiasm to the parent-child relationship, and they create an exciting and educational atmosphere in the home. ENTPs are natural teachers, who love to take every opportunity to help their kids understand the world and expand their minds. They are spontaneous and love to involve their children in new experiences, outings, and adventures. The ENTP parent believes in fostering independence in their children and having an open mind towards their unique personalities and preferences. Because of the ENTPs dominant Extraverted Intuition (Ne), they are able to help their children see numerous exciting possibilities for their lives. Their enthusiasm over these possibilities is often infectious, and together, the parent and child can enjoy any number of experiments and new opportunities. 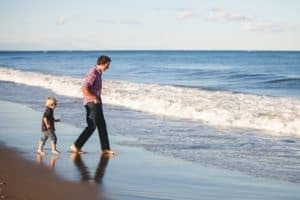 ENTPs give their children the confidence needed to tackle the struggles of life, and they make sure their children know they have their full acceptance. ENTP parents struggle with the mundane daily aspects of parenting. Dull chores like laundry and washing the dishes feel life-draining to them, and they’d much rather focus on exploring new possibilities and ideas. The ENTP can become depressed and overwhelmed if the majority of their day is spent taking care of household tasks and repetitive daily rituals. Parenting has its slow seasons, and this can be another source of frustration for the ENTP. They love to have outside stimulation to engage their dominant Extraverted Intuition (Ne), and can feel trapped and stifled by being stuck at home. They may also feel unsure what to do with children who are fussy or emotionally needy, because the ENTP places such a high value on independence. Since Feeling is only their tertiary function, and not very developed, the ENTP may not always know how to handle emotional crises and struggles their children face. They will try their best, but it may be stressful and difficult for them because dealing with emotionally charged situations forces them to rely on one of their least-preferred functions; Extraverted Feeling. 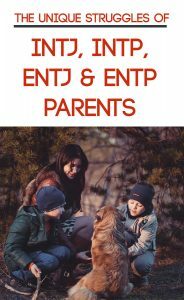 ENTP parents need to give themselves opportunities to engage in projects and activities outside of their parenting role. Engaging with friends, going on dates with a spouse, or volunteering for a project they are passionate about are just a few ways the ENTP can enjoy stimulating conversations and outside experiences. The INTP parent is a calm and accepting ally for any child. INTPs are patient parents who open-mindedly accept their children for who they are, always enjoying opportunities to answer their children’s questions and help expand their minds. The INTP fosters individuality and independence in their children, and they naturally dislike the idea of controlling or talking down to their children. While other parents may get frustrated with the many “why’s” children inevitably ask, INTPs enjoy this form of conversation. INTPs are natural skeptics, and they see this curiosity as a natural part of growing up that shouldn’t be stifled. With an INTP parent, a child learns that it’s okay to question, to look deeper, to be independent and to love learning. The child can delight in the quiet, intellectually stimulating nature of their parent, and can enjoy sitting on their lap and looking at encyclopedias or tinkering with a new experiment or project. INTPs can become bored and frustrated with the routine of family life. They like to have an unstructured schedule where they can pursue whatever interests pique their curiosity at any given time. Having to focus on a daily agenda, or having to perform routine, dull chores, can make the INTP parent depressed. They may find getting the children to school on time, doing the laundry, or getting meals to the table on time stifling and unnecessarily demanding. The noise and commotion of family life can be overwhelming to an INTP parent. Meeting their children’s constant needs and demands can feel overwhelming to them as introverts. Being told to “look at me!”, “listen to this!”, and “come here!” over and over again can wear the INTP out over time. INTP mothers can feel especially isolated in the parenting world. INTP females make up a mere 1.8% of the population, whereas the majority of females are SF personality types. As a result, the INTP can feel misunderstood or disconnected from other mothers. They may feel like their unique style of parenting isn’t appreciated or that they can’t quite discuss their own unique issues and struggles with anyone else who will understand. It’s especially important for the INTP to remind herself of the unique contributions she brings to her family. Being open-minded, calm, encouraging intellectual thought and learning are all extremely beneficial to her children. It’s okay if she doesn’t seem like the other moms out there. There’s nothing wrong with being who she is. Make time for yourself! As an introvert, you need time to ditch the schedule and the chores and just be alone and focus on your own interests. Whether you have to hire a babysitter or get your spouse to chip in a little more, making sure you have daily alone time is important. If you can’t get outside help, this may mean getting up early or staying up late so that you can enjoy some solitude and freedom from responsibilities and pressures. “It’s okay if she doesn’t seem like the other mom’s out there.” << take out the possessive 's to make it plural: moms, not mom's. Thanks. Could you do the sensing-judging type you mentioned at the top?